It’s so nice outside and I love just sitting in the sunshine on my back patio. Dad makes sure that he puts down my mat every day, so that I can soak in the sun whenever I want. 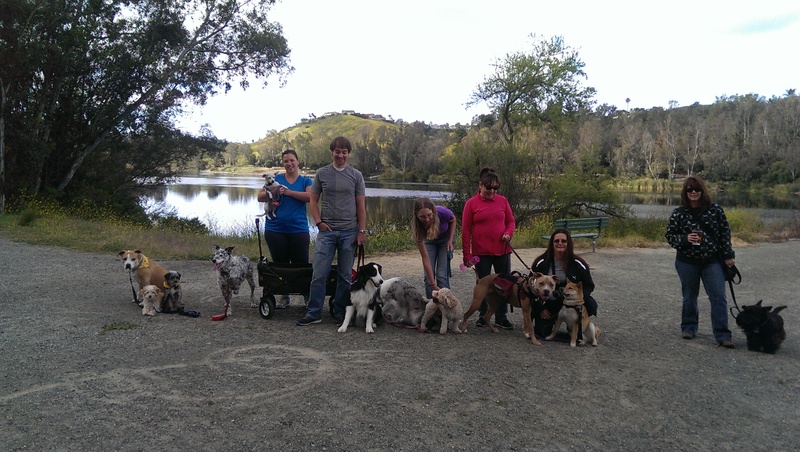 My family and I have been on the move this past weekend and I enjoyed my very first packwalk with my Active Dog Adventures friends! Saturday couldn’t have been more perfect for a walk around Laguna Regional park. 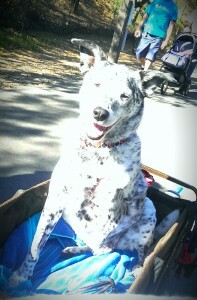 I was so excited to greet everyone, but dad made me ride in my wagon most of the way because I was getting a bit tired. I didn’t mind though. I was just happy to be out with my best pals! Me and my ADA Pals! When we got home, Dad made sure to give me a massage and also helped me to do my stretches. Actually, he did it a couple of times. Who doesn’t love a good massage? My Uncle Byron and our friend Mary came over to visit too. 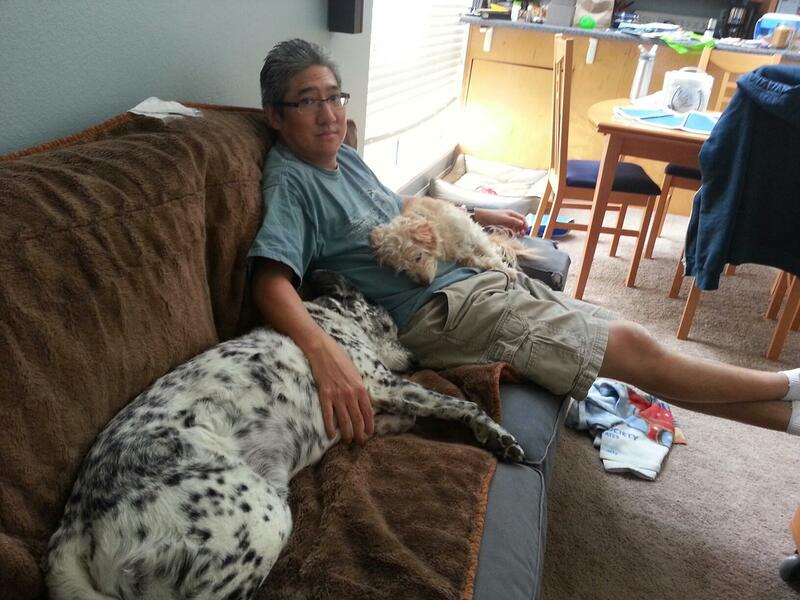 While I’m always happy to see them, I was super mellow from our adventure that I was content to lay on the couch and sleep. Sunday was a little more interesting. 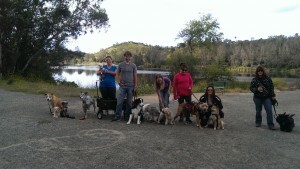 We took off to Irvine Regional Park to visit with our ADA Pack. I love this place! It has horses and peacocks and trees, trees and more trees!!! It was all super exciting and while dad let me take in some scents and a brief greeting to my friends, I rode most of the way. Every now and again, I got out of my wagon to check out something cool to pee on and walked a bit, but back in the wagon I would go (even though I didn’t want to). But that’s when it happened…. Dad went to lift me in my wagon and noticed that I let out a little yelp. Although I’m a sensitive Smudge, I’ve always put on my brave face and have never cried during the last couple of weeks… until now. 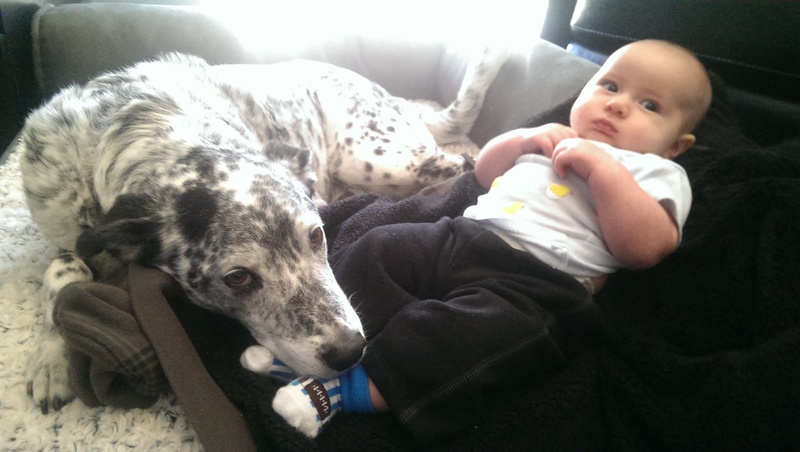 It was very slight and I rode happily in my wagon, but when dad looked down, he saw that my stump was bleeding. Dad’s pretty good with blood and stuff, but we both didn’t expect to see it happen so far after surgery. I had my stitches removed last Thursday and got fitted for my prosthetic and it never bothered me. So when dad saw the blood and pus (that’s when he got worried), he took me right back to the specialist. Dr. Chung saw me and they flushed my stump, took a culture of the wound and bandaged me up. I’m back on antibiotics too. 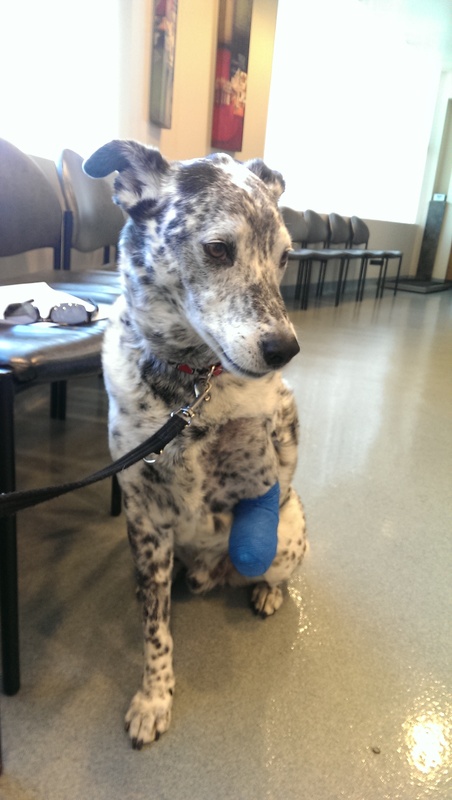 We won’t get our test results for a couple of days, but they think it’s an infection! Yuck!! Now, I have to go back tomorrow for a recheck and daily bandage changes. Dad feels horrible. I was supposed to start chemo this week, but that needs to be postponed until I get 100% better (and I will!). Back to the doctor and all wrapped up again! Now I’m on really restricted rest, with more training games, less wagon rides/walks and a whole lot of massages! Somehow, I don’t see how this is a bad thing for me. I’m still as happy as can be with a great attitude and I’m absolutely staying Pawsitive!!! But if you wouldn’t mind saying a quick prayer, sending a healing thought and good vibes for me, that would be terrific! It would be Smudgeriffic!! Have a super week and I really hope to get to visit with you or at least hear from you soon! Leave me a Facebook message if you like!